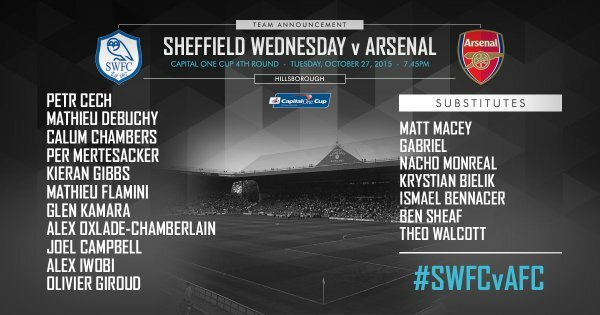 Capital One Cup game - Confirmed Arsenal Lineups against Sheffield. watch fast streaming Arsenal, shop now for Arsenal gears. Arsenal have revealed the lineup for the upcoming lash against Sheffield Wednesday in the fourth round of Capital One Cup. Following is the lineup along with the substitute list. Arsenal boss Arsene Wenger has made several changes to the squad. Key players have been rested for the next tough games. Petr Cech starts once again as David Ospina is still on the sideline through shoulder injury. Mathieu Debuchy started as expected along with Calum Chambers and Per Mertesacker in the central defensive role. Laurent Koscielny is rested, he is not even in the substitute list. Kieran Gibbs starts ahead of Nacho Monreal in the left-back role. While both regular starting players Francis Coquelin and Santi Cazorla have not travelled with the squad. Mathieu Flamini and younsger Glen Kamara start in the depper midfield role. Alex Oxalade-Chamberlain continues on the right-wing while Joel Campbell on the left wing. Another young talent Alex Iwobi start alongside Olivier Giroud in attack. Theo Walcott is on the bench and is likely to appear in the second half. Gabriel Paulista is dropped to bench along with Nacho Monreal. While the other subs are all young stars, Ben Sheaf, Ismael Bennacer, Krystian Bielik and Matt Macey.